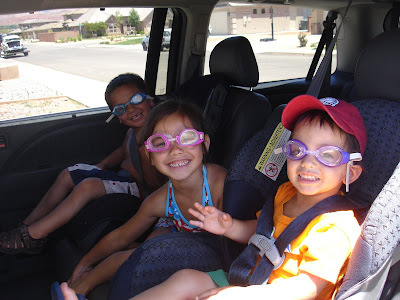 So I thought I would let you in on the funny personalities of each of my children. Allana wants to be a ballerina and a wants to be the center stage at all times. I wonder where she learned that from. HMMM. Here is some pics and videos of my little charmers... I really don't like or let Stevie dress up in Girls clothes... In fact my husband will probably kill me, but sometimes he does it when she is dressing up and I don't want to ruin the fun and make everyone cry. Hi to all my dear friends whom I have been a very bad blogger. I check all of your blogs every day and finally decided to update my own. To do a small update I am so glad summer is in session. All of my commitments have faded and my calender is surprisingly empty. So for fun we have been swimming, playing outside, cleaning the garage and watching football games. 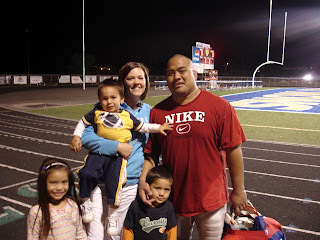 My husband joined the Semi Pro football team in St. George. THE ST GEORGE BLITZ.. It has been fun to watch him, though he has already tore his hamstring, bruised a rib, and almost ruined his knee. He has fun and it has been fun cheering on my man in tights. haha. Oh my gosh if I survive the years that my little man has given from age 0-3 I will be put in a world record book. My little Elijah is so independent, daring, mischevious and has no inhibitions. He isn't scared of repurcutions and doesn't realize his own strength. We have already had one tooth pulled because he almost knocked it out trying to slide in the bathroom in the tube and have had stitches 3 times one on the top of his head and two on his nose. He gets into everything, not once in a while daily. Here is a slide show of his ventures. This morning I found him in the freezer trying to get out waffles before I even got out of bed and he takes a knife and breaks open the child lock on my pantry to get out the pudding. He broke Allana full length mirror in her room on Saturday because he "wanted to slide down it so he put it on the side of the bed and slide down CRACK GLASS EVERYWHERE>" But i love the little man Check out the slide show.